With over 800 schools forced to close due to insecurity, and 2.3 million vulnerable people in need of assistance this year, a top UN official told the Security Council on Wednesday [16 January 2019] that the humanitarian situation in Mali “remains dire”. MINUSMA/Photo Marco Dormino | Bintou Keita, Assistant Secretary-General for Peacekeeping Operations, and Oscar Fernandez-Taranco, Assistant Secretary-General for Peacebuilding support, meet with the beneficiaries of UNWOMEN and UNFPA project supporting victims of sexual and gender-based violence at the Maison des femmes in Gao. Ms. Keita also reminded the Council of last year’s “significant increase” in the use of improvised explosive devices (IEDs), saying that mission’s UNMAS continent (UN Mine Action Service) was supporting the authorities, including with advice, training and specialized equipment to mitigate their risks. “We remain concerned about the further deterioration of the security situation in the centre where intercommunal violence, instrumentalized by extremist armed groups, has intensified over the past months,” she continued, spotlighting a deadly New Year’s Day attack. She said MINUSMA was working with the Government to respond to the rapidly evolving situation and protect civilians. Ms. Keita stressed the importance of the parties to the peace agreement keeping positive momentum going, and making “meaningful progress, without further delay”. She assured the Council of MINUSMA’s continued commitment to supporting the parties in implementing the peace agreement. For her part, Kamissa Camara, Mali’s Minister of Foreign Affairs and International Cooperation, highlighted that security measures are not enough when terrorist groups are working “relentlessly” to destroy social cohesion, weaken the State and extend their territorial control. 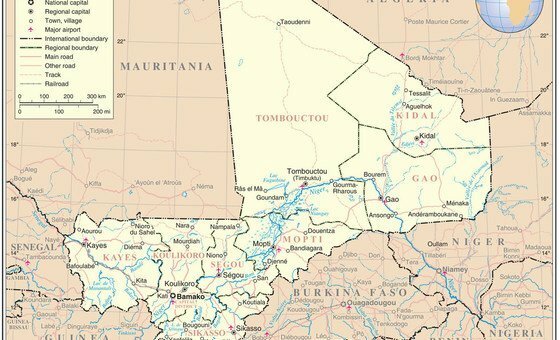 Meanwhile, as the Council was meeting, it was reported that gunmen had attacked two villages in the country’s central Menaka region near the border with Niger, killing at least 20 people – further underscoring the country’s volatile security situation. (SOURCE: UN News).